There is no doubt that the sight of a gum tree is iconically Australian and forms an integral part of the Australian identity. 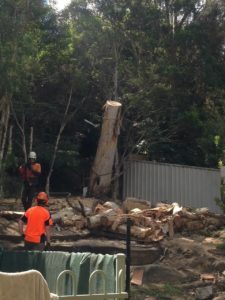 In fact, the government encourages the protection of trees, and many councils like the Sutherland Shire council are strategically planning to make sure trees remain a distinctive part of Sutherland Shire’s character. Not only do they provide much-needed shade on a hot summer’s day but play an important role in the keeping the ecosystem balanced. 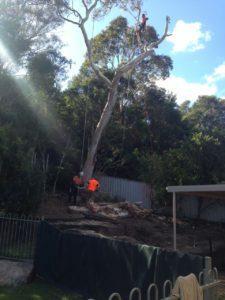 However what happens when you find you have a dead gum tree on your property, like a family in Gymea recently did? A dead gum tree can not only get infected with diseases which can compromise its structural integrity if left untreated but pose a danger to the home and people in it, especially one like this one when it is overhanging the house. These residents did the right thing and phoned Wolf Trees & Gardens to organise the tree’s removal. When you apply to remove a tree through a professional arborist not only is the council application expedited but the cost reduced. It wasn’t an easy job, but one we are familiar with. 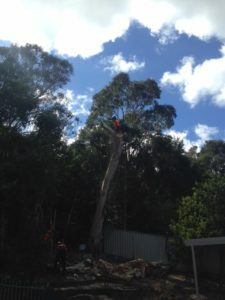 We overcame the challenges by rigging down from the taller live gum tree above smaller dead one. By using a professional, you are safe in the knowledge that we are fully insured and qualified and have years of experience assessing situations and making sure the process is safe. Call Jonnie for a free quote today!